Chag Purim Sameach everyone. This year, I added a new cookie for my mishloach manot that I am giving to my neighbors. I have wanted to try to make Iraqi date cookies ever since I first tried them a couple of years ago after finding them in a local greengrocer near my office. I was so happy when I found Maggi Glezer’s recipe. The recipe looks complicated, but the cookies are actually very easy to make and even easier if you can find ready-made date paste. You should be able to find a package or two at a Middle Eastern store. The ready-made filling is just pure dates without any added sugars of fillers. 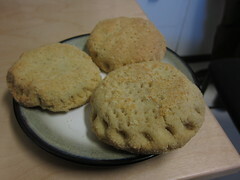 Ba’abe are flaky semolina pastry cookies filled with pure date puree. The sweetness of the dates is all that is needed for this delicious cookie. Besides being a Purim food, they are perfect for afternoon tea. Place the dough in a bowl. Cover with plastic wrap and allow to rest at room temperature for 30-60 minutes. Heat the dates and oil in a pan until they are warm to the touch. Knead them together until they form a paste. Cut out circles with a glass. Place a walnut-sized amount of date paste in the center of each circle. Take another circle of dough, and cover the date paste. Flatten it with your hand, and pinch the edges shut. Dip each cookie in the beaten egg. Place the Ba’abe on a baking sheet. Bake for about 20 minutes, until light golden brown. Michelle Kemp-Nordell is the creator of Baroness Tapuzina. She is a foodie who grew up in a “house of weird vegetables.” Follow her adventures as she experiments with exotic vegetables from her garden and spices from around the world.